The Council of Arab Economic Unity will hold a conference on the Arab digital economy on 16-17 December, it was announced on Wednesday in Cairo. 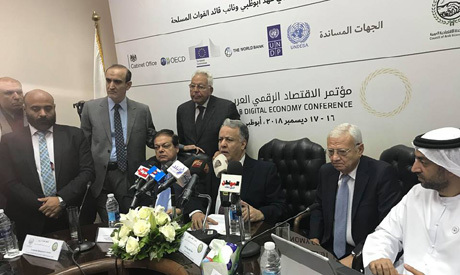 In a press conference held at the council’s headquarters, its general-secretary Ambassador Mohamed El-Rabei announced that the "A Common Vision For an Arab Digital Economy Initiative" conference was a serious attempt to revive economic unity between the Arab countries. The conference will for the first time present an initiative for a common Arab digital economy strategy, he said. El-Rabei said that the council had chosen Abu Dhabi to kick off the conference in its first ever edition because the leaders of the UAE presented their expertise and achievements in supporting a common Arab vision for a digital economy. "The Arab common market was launched in 1964,”he said. “Unfortunately, two generations have lived through those years with hopes of seeing in the real world that market which has not been fully achieved, but now we have a hope of achieving it through the digital economy system." Ali El-Khoury, the chairman of the Arab Federation for the Digital Economy and an advisor to the Council of Arab Economic Unity, said that the council had commissioned Cairo University in Egypt to design a strategy for an Arab digital economy built on the concepts of the digital economy and the fourth industrial revolution. El-Khoury added that a committee made up of Arab and international experts as well as international organisations like the UN and the World Bank would draft and revise the final strategy. He said that the strategy was being prepared to join the main files to be discussed in the upcoming Arab summit to be held in Tunis in March next year. According to El-Khoury, the conference will showcase different parts of the strategy, as well the economic opportunities in Arab countries that have resulted from the digital transformation. "I would like to hint that there are real opportunities for investments in technical and digital economy infrastructure in the Arab countries," he said, calling on officials, economy ministers and heads of central banks in the Arab word to attend. The conference is being held under the auspices of Sheikh Mohamed bin Ziyad Al-Nahyan, the crown prince of Abu Dhabi and deputy supreme commander of the UAE's armed forces. The World Bank, the United Nations Development Programme (UNDP), the United Nations Department of Economic and Social Affairs (UNDESA), and the European Commission are among the sponsors of the event. The Council of Arab Economic Unity is attached to the League of Arab States.